Among the Fathers of the second century his life is the best known, and from the most authentic documents. In both "Apologies" and in his "Dialogue" he gives many personal details, e.g. about his studies in philosophy and his conversion; they are not, however, an autobiography, but are partly idealized, and it is necessary to distinguish in them between poetry and truth; they furnish us however with several precious and reliable clues. For his martyrdom we have documents of undisputed authority. In the first line of his "Apology" he calls himself "Justin, the son of Priscos, son of Baccheios, of Flavia Neapolis, in Palestinian Syria". Flavia Neapolis, his native town, founded by Vespasian (A.D. 72), was built on the site of a place called Mabortha, or Mamortha, quite near Sichem (Guérin, "Samarie", I, Paris, 1874, 390-423; Schürer, "History of the Jewish People", tr., I, Edinburgh, 1885). Its inhabitants were all, or for the most part, pagans. The names of the father and grandfather of Justin suggest a pagan origin, and he speaks of himself as uncircumcised (Dialogue, xxviii). The date of his birth is uncertain, but would seem to fall in the first years of the second century. He received a good education in philosophy, an account of which he gives us at the beginning of his "Dialogue with the Jew Tryphon"; he placed himself first under a Stoic, but after some time found that he had learned nothing about God and that in fact his master had nothing to teach him on the subject. A Peripatetic whom he then found welcomed him at first but afterwards demanded a fee from him; this proved that he was not a philosopher. A Pythagorean refused to teach him anything until he should have learned music, astronomy, and geometry. Finally a Platonist arrived on the scene and for some time delighted Justin. This account cannot be taken too literally; the facts seem to be arranged with a view to showing the weakness of the pagan philosophies and of contrasting them with the teachings of the Prophets and of Christ. The main facts, however, may be accepted; the works of Justin seem to show just such a philosophic development as is here described, Eclectic, but owing much to Stoicism and more to Platonism. He was still under the charm of the Platonistic philosophy when, as he walked one day along the seashore, he met a mysterious old man; the conclusion of their long discussion was that the soul could not arrive through human knowledge at the idea of God, but that it needed to be instructed by the Prophets who, inspired by the Holy Ghost, had known God and could make Him known ("Dialogue", iii, vii; cf. Zahm, "Dichtung and Wahrheit in Justins Dialog mit dem Jeden Trypho" in "Zeitschr. für Kirchengesch. ", VIII, 1885-1886, 37-66). 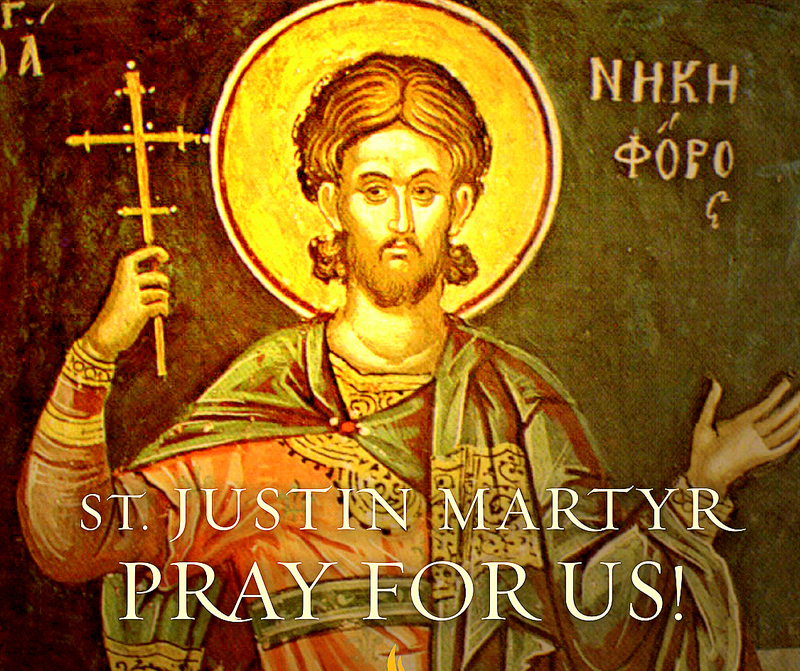 The "Apologies" throw light on another phase of the conversion of Justin: "When I was a disciple of Plato", he writes, "hearing the accusations made against the Christians and seeing them intrepid in the face of death and of all that men fear, I said to myself that it was impossible that they should be living in evil and in the love of pleasure" (II Apol., xviii, 1). Both accounts exhibit the two aspects of Christianity that most strongly influenced St. Justin; in the "Apologies" he is moved by its moral beauty (I Apol., xiv), in the "Dialogue" by its truth. 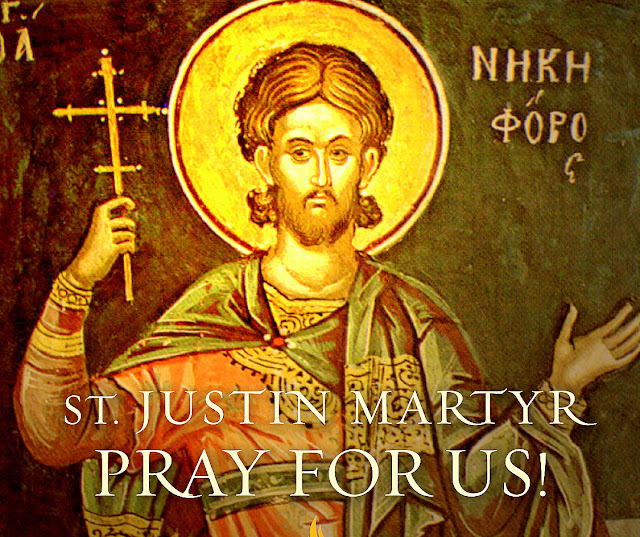 His conversion must have taken place at the latest towards A.D. 130, since St. Justin places during the war of Bar-Cocheba (132-135) the interview with the Jew Tryphon, related in his "Dialogue". This interview is evidently not described exactly as it took place, and yet the account cannot be wholly fictitious. Tryphon, according to Eusebius (Church History IV.18.6), was "the best known Jew of that time", which description the historian may have borrowed from the introduction to the "Dialogue", now lost. It is possible to identify in a general way this Tryphon with the Rabbi Tarphon often mentioned in the Talmud (Schürer, "Gesch. d. Jud. Volkes", 3rd ed., II, 377 seq., 555 seq., cf., however, Herford, "Christianity in Talmud and Midrash", London, 1903, 156). The place of the interview is not definitely told, but Ephesus is clearly enough indicated; the literary setting lacks neither probability nor life, the chance meetings under the porticoes, the groups of curious onlookers who stop a while and then disperse during the interviews, offer a vivid picture of such extemporary conferences.